Oooooeeeeoooooooooooo! He's back (again)! And it's about time (again)! Martha Jones, the new companion. Okay, she's not Rose. No one could ever be Rose. But, you know, she'll do. She's a medical doctor (well, almost), that should come in useful. She certainly could use a break from her insane, always argueing family. And she's, well, if I need to describe her in one word, I'd pick "sensible". While her family bickers away, she's the calm in the middle of a storm. And when things go seriously pear-shaped at the hospital, she keeps the coolest head (next to the Doctor). The Judoon. Possibly just a leeeetle close to the Sontarans. Fortunately, their motivations are plenty different. The Sontarans are all about combat and conquest. The Judoon are about enforcing rather extreme laws and sheer bloody-mindedness. One especially interesting character moment for him, though. When asked if he had a brother, he responds, "Not anymore." Oink? Where's that headed? 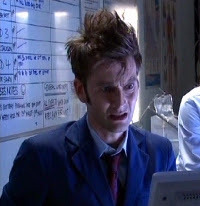 The Doctor appears to Martha early in the episode, takes off his tie and says, "Like so? See?" Martha tells the Doctor about this later on. The Doctor travels back through time to prove he can do so and takes off his tie in front of her. So... where did the tie-removal idea come from? The Doctor took of his tie because, well, because he took off his tie. It's Bad Wolf all over again! All in all, a very good episode to introduce a companion in. Posted by Doug A Scott at 12:37 p.m.
See, while I loved Rose, I didn't think she and 10 were good together. They were too smug and over-the-top with the One! Twu! Wuv! thing. I think Martha will ground 10 more, which is what he needs. I can't wait until it starts showing in North America, though, so that Television Without Pity can get their hands on it. April 3, 2007 at 4:24 a.m. So, you've seen this, then? I really liked Rose and the 10th Doc together. Moreso than her and the 9th. Maybe because the 10th was a lot less angsty than the 9th. He does need somebody around to ground him, though. I think that was proved in "The Runaway Bride". April 4, 2007 at 7:45 p.m.
See, I thought Rose and Nine had incredible chemistry, and she was exactly what he needed. And I watched that season AFTER two. so I had the whole "you're not my doctor" thing to contend with. But Rose and Ten were just....too much. Plus Rose was always more awesome when the Doctor wasn't around. I'm glad it's back! Perfect timing, now that Battlestar is over for the next NINE MONTHS. April 5, 2007 at 4:38 a.m. I know not of the Doctor that is Who. Yes, it is a gap in my cultural education - a GAPING gap, granted (0oh - alliteration...) - but there you go. Nevertheless, having just discovered the blog of the DougAScott (who was remiss in not actually TELLING me he had a blog until, y'know, really recently), I still wanted to pop in and say DUDE! I breathlessly await more disturbing library finds and shall add you to my list of cool bloggy goodness. April 9, 2007 at 1:21 p.m.
April 9, 2007 at 7:21 p.m.
Also, the Doctor is cute. And sometimes, there is Captain Jack. Mmmm. Captain Jack. Yes, I'm shallow. And proud. April 9, 2007 at 8:46 p.m.